The Houston Astrodome, home of the USFL's Houston Gamblers, was billed as the "eighth wonder of the world" when its doors opened in 1965 as the "Harris County Domed Stadium." Built to house baseball's Houston Astros, the facility was the first in the so-called cookie cutter era of stadium building. Its round, coliseum-style facilities were capable of hosting different types of events, but incapable of being perfectly suited to many of them. The AFL's Houston Oilers moved to the dome in 1968, but after three decades would leave for Tennessee when the City of Houston dragged its feet on requests to replace the facility. It would only be after the Houston Astros also threatened to leave town that the city acted, building new facilities for both baseball and football. By the time the Gamblers came on the scene in 1983, the Astrodome was already beginning to show signs of age. Rats were sometimes seen at Astrodome events, not enhancing the image of the facility or the team. With Jim Kelly behind center and one of the best young receiving corps in all of pro football, attendance showed hopeful signs during the team's 1984 debut season that saw the Gamblers go 13-5-0 and win the USFL Central Division. With the USFL announcing its move to the fall in 1986, thereby placing the Gamblers in direct competition with the Oilers, 1985 attendance dropped below an average of 20,000. 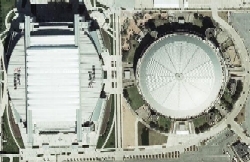 Save the periodic event, the Astrodome became a vacant building, dwarfed in popularity and size by its replacement, Reliant Stadium, which was opened in 2002 as home to Houston's new NFL team, the Texans. As part of the deal to build the new stadium, Reliant received naming rights to the Astrodome as well.